This week I’m going to post about the epic color purple! A lot of people view it as a more feminine color, but it has a very wide range of uses and meanings. Violet has shown to alleviate conditions such as sunburn due to its purifying and antiseptic effect. This color also suppresses hunger and balances the body’s metabolism. Violet and purple support the practice of meditation. Purples have been used in the care of mental or nervous disorders because they have shown to help balance the mind and transform obsessions and fears. Violet is associated with bringing peace and combating shock and fear. Violet has a cleansing effect with emotional disturbances. Also, this color is related to sensitivity to beauty, high ideals and stimulates creativity, spirituality and compassion. Psychic power and protection has also been associated with violet. Purple is associated with spirituality, peace, calmness, empathy, dignity, royalty, individuality, imagination, creativity, inspiration, dreams, oddities, psychic abilities, inventiveness, selflessness, mystery, fantasy, immaturity, impracticality, cynicalness, pompousness, arrogance, delusions, controlled emotions, wisdom, sensitivity, luxury, wealth, nobility, poison, depression and humility. Purple is the most prominent color that is not traditionally connected to any major ideology. As such, it is sometimes used to represent a mix of different ideologies, or new protest movements that are critical of all previously-existing parties. Purple is also unofficially used in the United States to denote a “swing state” (i.e., one contested frequently between the Republican Party, whose unofficial color is red, and the Democratic Party, whose unofficial color is blue). In the west, purple or violet is the color most associated with piety and faith. In the Roman Catholic liturgy, purple symbolizes penitence; priests wear a purple garment when they hear confession. Purple robes are also worn as part of the academic dress worn at graduation and university ceremonies by students of theology. Purple is also often worn by senior pastors of Protestant churches, and by bishops of the Anglican Communion. The color purple is also associated with royalty in the Christian aspect. In Europe and America, purple is the color most associated with vanity, extravagance, and individualism. Among the seven major sins, it represents vanity. In Chinese astrology the North Star was the home of the Celestial Emperor, the ruler of the heavens (the area around the North Star is called the Purple Forbidden Enclosure in Chinese astronomy). For that reason the forbidden city in Beijing was also known as the purple forbidden city (zi Jin cheng). In Wicca, purple is used in rituals for spiritual protection, help in meditation and contact with the spirit world. It is also said to increase psychic powers. Violet represents healing, spirituality, spiritual and magical power. In astrology, purple is associated with the sign Sagittarius, and loosely with Pisces. The Chinese Zodiac signs, the Boar and the Rat, are associated with purple. The Crown Chakra is violet/purple and located at the top of the head. The Crown Chakra governs self-awareness and a direct connection to Deity; it is also related to the brain as a whole. Archangels Uriel, Anael and Zadkiel are sometimes connected to certain shades of purple. Violet is associated with Jupiter, the metal tin, the jewel Sapphire, and the musical note B. The reason purple is often connected to royalty and luxury is because for many years in Europe, purple was only allowed to be worn by royalty because of how expensive purple dye was to make. Well, thanks for reading this week’s post! I hope you all found it fun and interesting! Check back next week for when I write about the color pink! 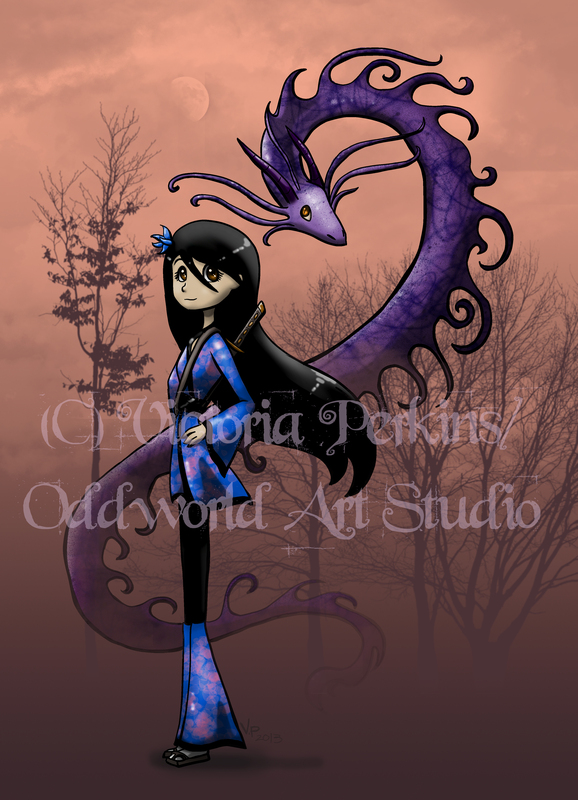 This entry was posted in On Color and tagged art, color, esoteric, magick, odd, oddworld, politics, psychology, purple, religion, spirituality, symbolism, victoria perkins. Bookmark the permalink.